I love corn. I do. Ever so versatile, so tasty, so reliable and utilitarian, it can stand up to anything, from start to finish. Shuck an ear of corn and dry the husks for homemade tamales, or use the extras as a fire starter. Sprinkle raw corn on a salad or soup, or pour a cup into your homemade corn muffins for sweet, crunchy glory, or freeze a bunch for a surprising late summer perk in the middle of winter. Cook them up in corn chowder — or any chowder for that matter. And then when you’ve nothing left but the cob, freeze it and use it … in stock. 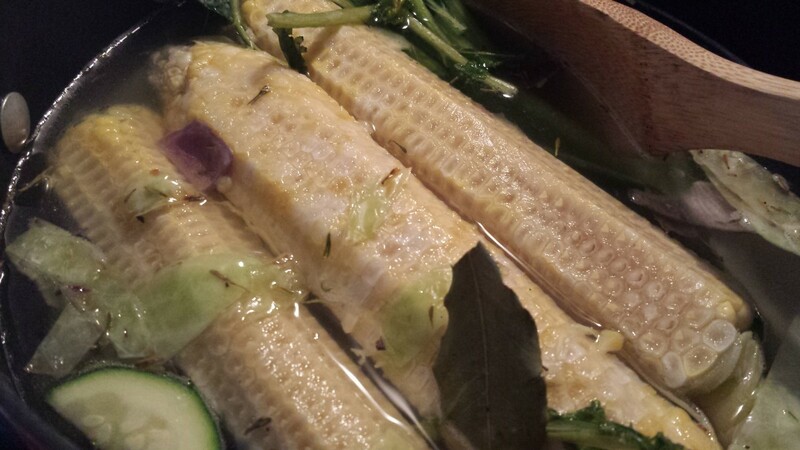 Corn stock is one of my favorite stocks to make and consume. It is rich and pretty, soothing and slightly creamy, offering up all of its scrumptious sweetness and starch to enliven a soup. I save all of the cobs that I can and make corn stock for vegetable soups and chowders. Although we aren’t big meat eaters around here, corn stock is a great substitute for soups calling for chicken stock. I think that you will be surprised by how delicious and easy it is. In a medium or large stock pot, heat the oil over medium heat. All at once, sauté the onion, zucchini, garlic and cabbage for about five minutes or until it browns a bit, stirring occasionally. Sprinkle with a little salt, pepper and all of the thyme, tossing to coat. Cook for one or two more minutes. When it appears that there isn't much liquid in the bottom of the pan, pour the water into the pot and stir. When the water begins to gently roll between the vegetables, add the corn cobs, green stalk and bay leaf, making sure to submerge them. Let it come to a boil. Boil for just a couple of minutes, then turn the heat to medium-low and partially cover, stirring occasionally. After a couple of minutes, taste your stock. It is likely that you will need all of the salt, but add a bit at a time and stir to incorporate it. Season your stock to your liking. The end result will make for a great soup (just remember that you salted your stock first!). Add your pepper, too. Stir. Let it cook at medium-low heat partially to mostly covered for about fifteen minutes. After about fifteen minutes, turn off the heat and let the stock cool on the stove until it is easy to handle. Strain the stock and batch it according to your ideas -- a quart for soup, a cup for sauce and so on. Freeze it or can it if you have the desire. Delicious!